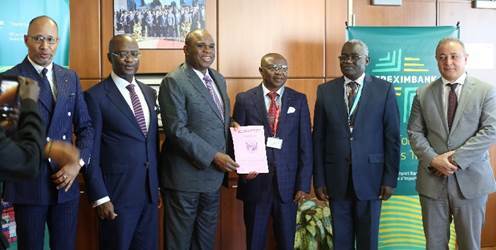 Afreximbank President Prof. Benedict Oramah (4th right) displays the ratification document received from Claude Rameaux Bireau, Minister of State and Economic Adviser to the President of the Central African Republic. With them are (L-R) Jean Jules Jos, Former Minister of State in charge of Programme at the Presidency of Central African Republic; Dr. George Elombi, Executive Vice President, Governance Legal and Corporate Services, Afreximbank; Clement Bilege, Ambassador of Central African Republic to Egypt; and Amr Kamel, Executive Vice President, Business Development and Corporate Banking, Afreximbank. Central African Republic today in Cairo formalised its membership of the African Export-Import Bank (Afreximbank) with the deposit of the instrument of the country’s ratification of the Bank’s Establishment Agreement with the continental trade finance institution. Speaking during a ceremony at the Bank’s headquarters, Claude Rameaux Bireau, Minister of State and Economic Adviser to the President, who led a five-member delegation, said that Central African Republic had very high expectations from Afreximbank and looked forward to strengthened cooperation with the institution. Mr. Bireau said that Central African Republic would move quickly to take up shareholding in the Bank and announced that the government was already working with the African Development Bank to support it in that regard. He added that the country would participate in the Intra-African Trade Fair, which was being organized by Afreximbank in collaboration with the African Union. The trade fair will take place in Cairo from 11 to 17 December. Earlier, Prof. Benedict Oramah, President of Afreximbank stated, said that the Bank was created to support African countries in both good times and bad times and that the ratification of the Agreement by Central African Republic would make it possible for it to effectively do business in the country. “The ratification grants us the special privileges and immunities that make it possible for us to take the risks that other commercial banks cannot,” Prof. Oramah explained. He announced that the Afreximbank had been reviewing six projects, which the country had identified as priorities in order to see how to support them, saying that Central African Republic, with its rich resources, could be an investors paradise if well-marketed. Central African Republic had initiated the process of joining the Bank on 28 November 2017 when it presented an instrument of accession to the Bank Agreement to Prof. Oramah when he met with President Faustin-Archange Touadéra in Bangui. Membership of the Bank gives the Central African Republic automatic access to the full range of products and facilities offered by Afreximbank, including trade finance facilities, project finance services, trade information and advisory services, support in the development of a local content policy and assistance in developing and implementing industrial parks and special economic zones. There are 50 countries currently on the list of Afreximbank participating and shareholding states, including Angola, Benin, Botswana, Burkina Faso, Burundi, Cameroon, Cape Verde, Chad, Central African Republic, Comoros, Côte d’Ivoire, Democratic Republic of Congo, Djibouti, Egypt, Equatorial Guinea, Eritrea, Ethiopia, Gabon, Gambia, Ghana, Guinea, Guinea Bissau, Kenya, and Lesotho. Also on the delegation were Clement Bilege, Ambassador of Central African Republic to Egypt; Jean Jules Jos, Former Minister of State in charge of Programme at the Presidency; and Batolo Mathiu and Amadou Issa of the Embassy of Central African Republic in Cairo. Participating in the ceremony from Afreximbank were Dr. George Elombi, Executive Vice President, Governance Legal and Corporate Services; Amr Kamel, Executive Vice President, Business Development and Corporate Banking; Rene Awambeng, Global Head, Client Relations; Obi Emekekwue; Global Head, Communications and Events Management;Gerald Chihota, Head of Board Secretariat; and Jacqueline Clarisse Motsebo of the Board Secretariat.